Miss Blush full skirt plunge halter formal dress. Features satin effect fabric with backless halter style. Plunge v neckline with mesh modesty panel. 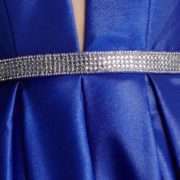 Pretty diamante band on waist with voluminous full skirt. Miss Blush full skirt plunge halter formal dress. This is a show stopping dress fit for any lavish formal event. Feel every bit glamorous and special in this full skirt gown. This is a dress of your dreams and will make you the star attraction at your next formal, prom, debs or black tie occasion. Features all over satin effect fabric with a full skirt and those lovely little hidden pockets. Netted underneath to ensure that the volume stays. The halter neck has a plunge v at the front with mesh insert for modesty coverage. The halter style leaves the dress backless and the waist is defined by the beautiful diamante band. The only choice is what colour?